We administer retirement programs for Michigan's state employees, public school employees, judges, state police, and National Guard members. This includes over 530,000 customers (approximately 227,000 active and 281,500 retired members). Nearly one out of every fourteen Michigan adults living in one out of every nine Michigan households benefits from our services. We serve one out of every nine Michigan households and nearly 800 employers across the state. 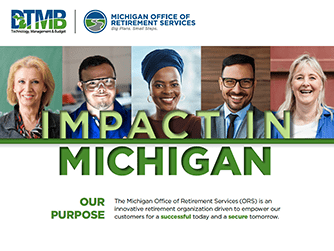 The retirement plans we provide to our members send positive ripples across Michigan. Learn how here. Retirement readiness involves more than just money. Think about what will give your life meaning after you retire, and then estimate your financial needs to make it happen. Check out these tips for a successful and fulfilling retirement. Ever wondered how ORS's investments are managed? And, what are our investment goals? Click here for an overview of ORS's financial information.